The fruit is medium in size (8-8.5 g), heart-shaped, and features a very dark, glossy red skin; and a sweet, juicy, red medium-firm flesh. 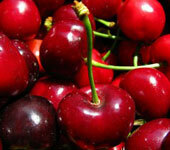 In the Italian town of Vignola (famed for its cherries), ripening occurs around 25 May. 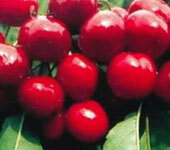 Medium to large fruits with a flattened heart shape, the skin is bright red, almost black, and the sweet red flesh is very firm and has excellent flavour. Ripening takes place in the beginning of June. 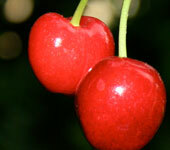 Samba cherries are large in size and heart-shaped; the dark red skin conceals red, medium-firm flesh that is crunchy and juicy; not overly sweet, Samba cherries are best eaten only when totally ripe. 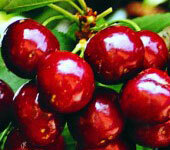 Grace Star cherries are a self-fertile variety, with attractive fruits (in terms of shape, colour, and size). 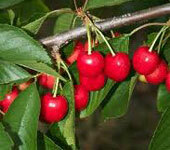 Even if not pruned, the tree naturally yields large fruits with long stalks, and the crop is always plentiful. Early Lory variety is a medium-vigour, slightly compact tree, with a spreading habit and medium crop capacity. The fruit is medium in size (8-8.5 g), a flattened heart shape, and features rich red, slightly speckled skin; clingstone with pink, firm, slightly juicy flesh. Ripening takes place in the first ten days of May. A medium-high-vigour tree, with erect habit. Self-incompatible; confirmed pollinators: "Sunburst", "Sylvia" and "Summit". 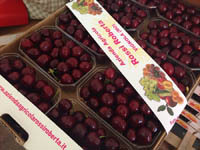 The large fruits (9-10 g) are heart-shaped and a glossy dark red colour; with a firm, juicy, pink flesh, the excellent flavour is appreciable even when not fully ripened. Ripening takes place around the second ten days of June. The Ferrovia is a vigorous tree with erect habit and medium crop capacity. Self-incompatible; ; confirmed pollinators: "Sunburst", "late-ripening Ravenna" and "Durone Nero III". The large fruits (8.5-9 g) are heart-shaped and a vibrant red colour; a clingstone, with juicy firm pink flesh, which deepens in shade closer to the stone, and good flavour characteristics. 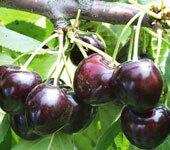 Ripening takes place around mid-June (from 13th to 20th June). 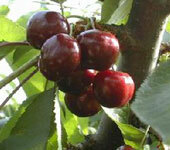 This variety has medium-vigour trees with a spreading habit. The fruit is the same as the late-ripening Anella, which is why it is called Anellone. 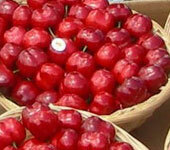 It produces large fruits, with a perfectly spherical shape, a thin, vibrant red skin. The firm, medium-juicy flesh is yellowy white and tinged with red. 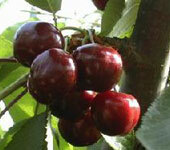 Ripening takes place around mid-June (from 8th to 18th June). 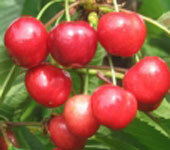 Summit cherries are medium to large in size, with high crop capacity. The skin is the colour red wine, the flesh is pink, quite firm, and offers good flavour qualities. Ripening takes place in mid-June. 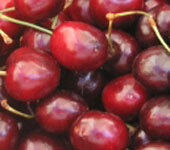 A delicious self-fertile variety that quickly begins to fruit steadily. 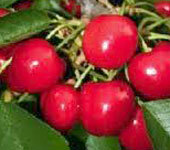 The fruits are large in size, bright red in colour, crunchy, and not prone to cracking. Ripening takes place at the beginning of June. 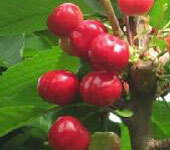 A medium-vigour tree with semi-spreading habit and early fruiting, with high crop capacity. Self-incompatible. Large, broad fruit (9.5-10 g) which changes from bright red to dark red when fully ripe; the flesh is red, firm, and offers moderate flavour qualities. 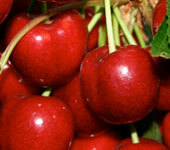 Ripening takes place at the beginning of June (from 1st to 10th June). The Rita variety flowers early, has a spreading habit and a medium/high crop capacity. The fruit is early-ripening, circular in shape, and medium in size. It is dark red with a speckled blush. Medium flavour, soft flesh. Sensitive to cracking and moderately sensitive to monilia. Early-ripening, it requires 2/3 pickings. A vigorous tree with erect habit, widespread in the Vignola area. 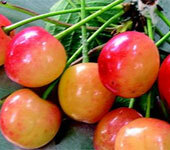 Firm, medium to large fruits, yellowy pink in colour, with a pleasant flavour. It is ideal for industrial processing. Pollinators: Durone Nero I di Vignola, Durone Nero II di Vignola. Ripening takes place around the second ten days of June. The Early Bigi variety is an early-flowering medium/high-vigour tree, with spreading habit and a high crop capacity. The fruit is large, spherical in shape and dark red. Ripening is early and even. Fruits are good sized. This fast-fruiting tree requires vigorous pruning. Not self-fertile. Ripening takes place in mid-May. This high-vigour, compact tree has an erect habit; Self-compatible; the rather large fruits (10.,5 g) are kidney-shaped and a dark red colour; sweet, dark red flesh, which is very juicy and quite firm. Ripening takes place around 25 May. 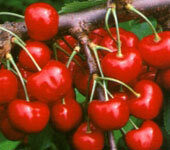 Lapins cherries are medium to large in size and heart-shaped; the rich speckled red skin conceals firm, red flesh that is crunchy, juicy and has good flavour. Ripening is late, at the end of June. 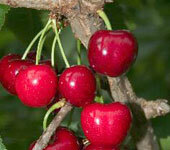 A medium-vigour tree with spreading habit and fast fruiting, with high and constant crop capacity. Self-compatible. The large glossy fruits (9.7 g) are long and heart-shaped with a deep red colour; juicy, very firm pink flesh and good flavour characteristics. Ripening takes place at the beginning of July. 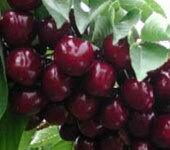 Bigarreaux Burlat cherries. 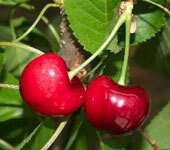 Early-fruiting, early-ripening cultivar with a sweet flavour. 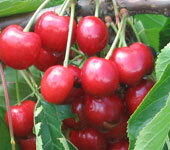 Ripening takes place from 20th to 30th May.